Hah, I was actually just thinking about posting a thread like this. I'd love to see more of what everybody's working on. Will post some pics soon. I really really like the one with the green-ish colored stem!! I hope you have more of that rod stock. After a few months of not being able to work on some pipes I finally got back in the shop. This is the rough shape and I will put the shank on a diet Today and fine tune the bowl shape. Currently dialing in the shape on a saxophone themed pipe for a one of my best friends who plays the Sax in a few bands. A number of artisans have done shapes that they call "saxophones", but I wanted to try something a little different. To increase the aspect ratio of the pipe and make it closer in form to the instrument itself I decided to construct it in multiple segments. 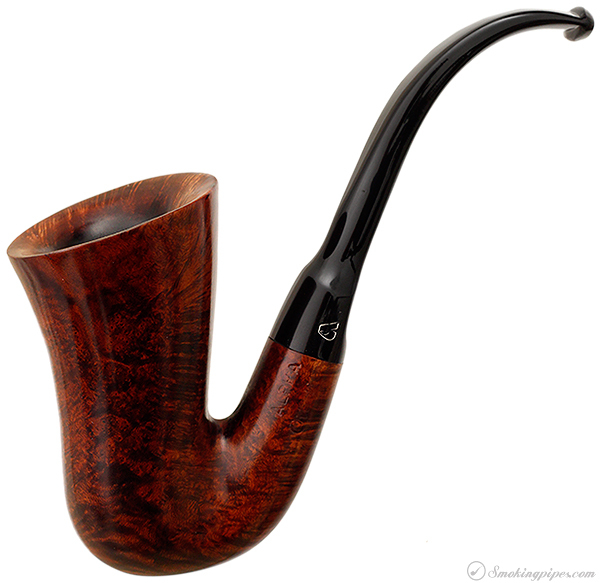 The lower segment is drilled much like a peterson system pipe, containing the tobacco chamber and a "system" chamber behind it in the shank. The middle segment is drilled fairly open and connects with the lower segment via a typical delrin tenon fit. The stem is just black ebonite, which I thought appropriate considering Sax mouthpieces are made of...black ebonite. I'll probably make a display stand of some sort as well, particularly considering the guy I'm making it for is a very occasional pipe smoker and I'm imagining it's going to have much more use as a neat curio than a tool. Love that shape, looks good so far. One of my favorite versions is the Alpha Citation Sax. Dig it! Are you gonna try to represent a reed? No, I don't think so. I'm going to try and do a simple facsimile of the contour of a mouthpiece, but otherwise keep it as functional and typical as possible. As Mr. Eltang says, the last inch of a pipe isn't the place to be artistic. I just love your sandblasting work. btw what tool do you guys use for forming the flat part of the them and the button? files? That is great work. I can't wait to see this finished. That looks like it's going to be a really nice birds eye grain? Thanks. Yes, files, sandpaper, sanding belt. time, I never could it get to work propperly at all. therefore, files (which worked ok) and sandpaper (which takes ages) where what I used since. I usually get as close as I safely can with a grinding wheel, just to get the majority of the material off, then all final shaping and thinning as well as button sculpting with files.